Makes 25-30 pieces, depending on size. (This recipe uses soy milk but you may use whole milk if you are not intolerant to dairy). * If you can find blanched whole almonds, use these instead. Simply skip step 1. 1. Soak almonds in boiling water for 2 minutes, drain and cover with cold water. Pop almonds out of their skins and pat dry. 2. Blitz almonds with oil and soy milk in a food processor until a smooth paste is obtained. 3. Add sugar and cardamom and blitz until evenly incorporated. 4. Heat a medium non-stick pan over medium heat. Pour in almond paste. 5. Cook and stir almond paste for 8-10 minutes, stirring constantly until the mixture thickens and starts to leave the sides of the pan. 6. Remove from heat and continue to stir for 2 minutes. 7. Pour onto a greased plate or a sheet of parchment paper. Spread out using an oiled spatula to 1 cm (3/8 inch) thickness. 8. 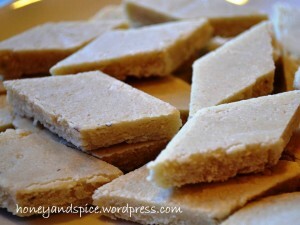 After 5-10 minutes, the burfi should have slightly set. Cut into pieces and allow to cool fully, around 20-30 minutes, before separating the pieces and enjoying. NOTE: If the burfi doesn’t set, you need to cook the almond paste longer.